Mobile apps for fun and play. 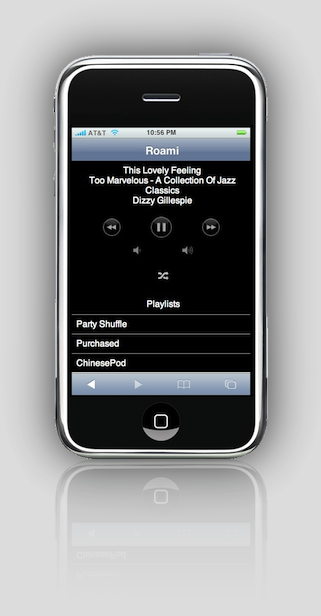 Remote control iTunes via your iPhone or iPod Touch. Now you can control iTunes from anywhere in your house. Or, punch a hole in your firewall and drive your pets crazy while you're at work. Use Roami to view and select playlists, play/pause music, shuffle selections, and adjust the volume of iTunes running on your Mac. You'll no longer need to run back to you Mac to adjust the music.. just press a button on your iPhone or iPod Touch. No software is loaded on your iPhone; it's all done through Safari. Download v1.1.0 [3.6 MB] . Only works on Macs right now. Free to try for 14 days. $9.95 to enjoy forever. Works on most Java-enabled phones with MIDP 2.0 support. Phone: Open this page from your phone's browser. Click here to download to your phone. Off you go! Computer: Click here to download to your computer. Transfer the file funPhotos.jar to your phone via Bluetooth, USB, or IR. You know the rest of the drill. Choose a keyword. 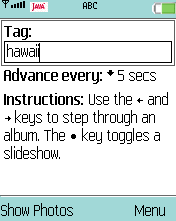 For example, let's check out hawaii today. Oooh. 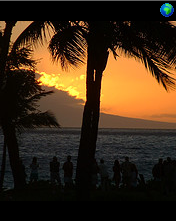 Wish I was there..
© 2007 iliotech software services, LLC. All rights reserved.